Mackenzie is leading KOIN Tower, an iconic building in downtown Portland, through an extensive renovation that has resulted in a renewed brand and sense of local connection. 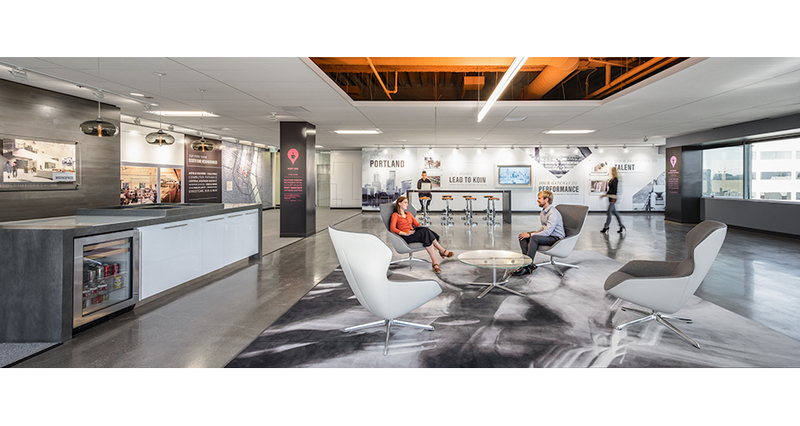 An integral part of this complex project is the Tower’s Leasing Center on the 11th floor, which introduces the building’s brand and amenities to prospective tenants. 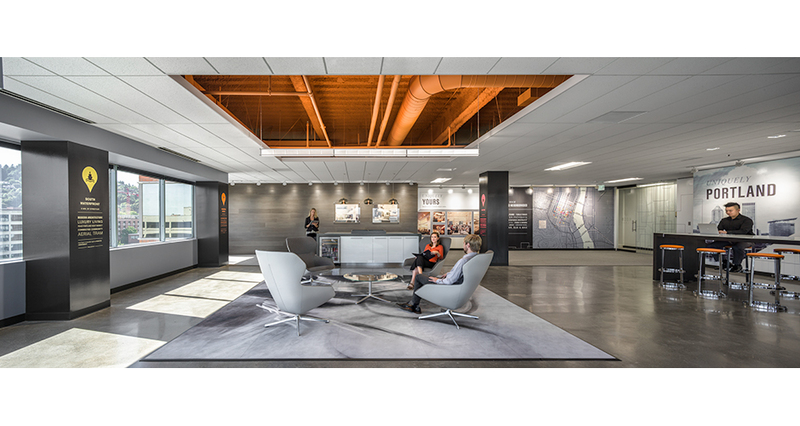 The Leasing Center needed to elegantly illustrate two things: KOIN’s brand story, and the physical fundamentals of an occupant’s experience of the building. By carefully thinking through these two distinct—but basically connected—elements, Mackenzie was able to design an expressive and deceptively simple space. We achieved this integration of brand and design through close collaboration with our brand strategy partners Think Joule. Sample finishes and ceiling applications are displayed so prospective tenants can have an immediate tactile sense of the possibilities at hand. 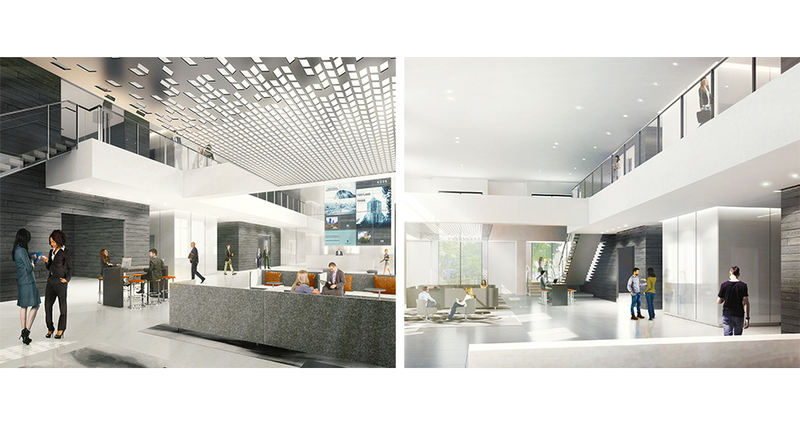 While the lobby is under construction, the Leasing Center is displaying renderings of what the new experience will look like, along with a planar screen representing the 18’ by 16’ media wall that will be an interactive focal point of the new space. These illustrations give a sense of what it will feel like to arrive in the building once it’s completed. 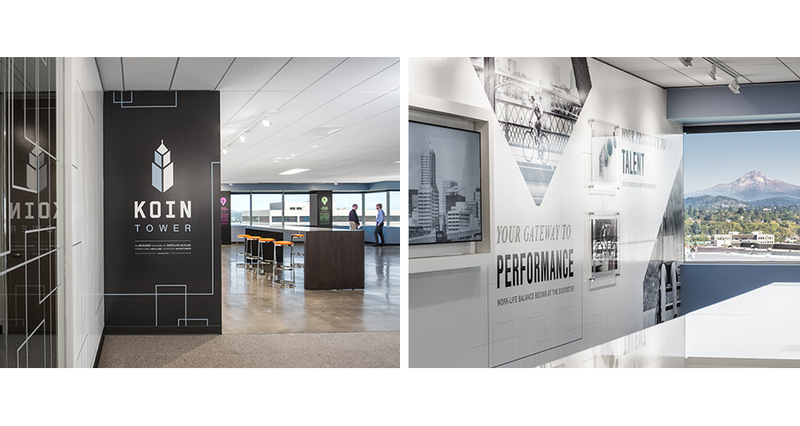 KOIN Tower’s brand is intimately connected to its neighborhood, and this connection is explored in displays and graphic walls. This attention to storytelling and building context responds to all the natural questions a prospective tenant might have.